This is a common observation of our customers that sit and watch the various feeding habits of the birds that visit their yards. Chickadees and Tufted Titmice do flit to the feeder, grab a seed and then disappear into the closest shrub or tree in order to eat. 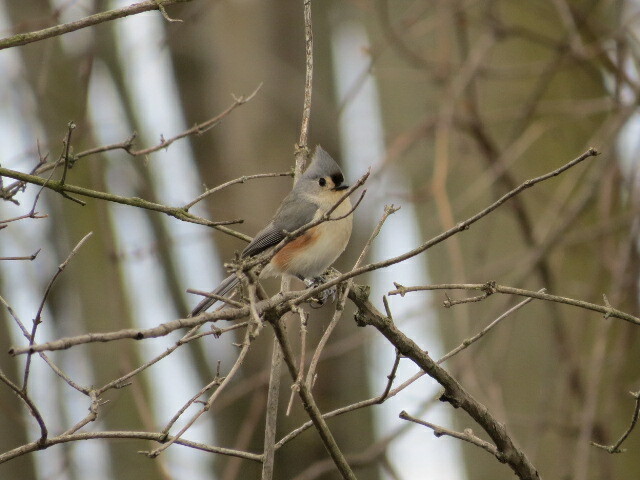 Sometimes, they may stay at the feeder for a few moments, picking up a seed and evaluating its’ weight in order to ensure that the energy they expend will be worth the prize inside. Once a seed is selected, these members of the Paridae family cannot open the seed while sitting on the small perch of a feeder. The seed needs to be held between their feet while the bird uses its’ small beak as a chisel, excavating the outer shell to reach the nut meat inside. Blue Jays feed in the same manner, as their beak is not built for cracking a seed between the upper and lower mandible. Instead, they place the sunflower seed from your feeder under their feet and use only their lower bill to hit the seed. Blue Jays are equipped with a special flange on the lower jaw that braces it against the skull, creating a more effective chisel. 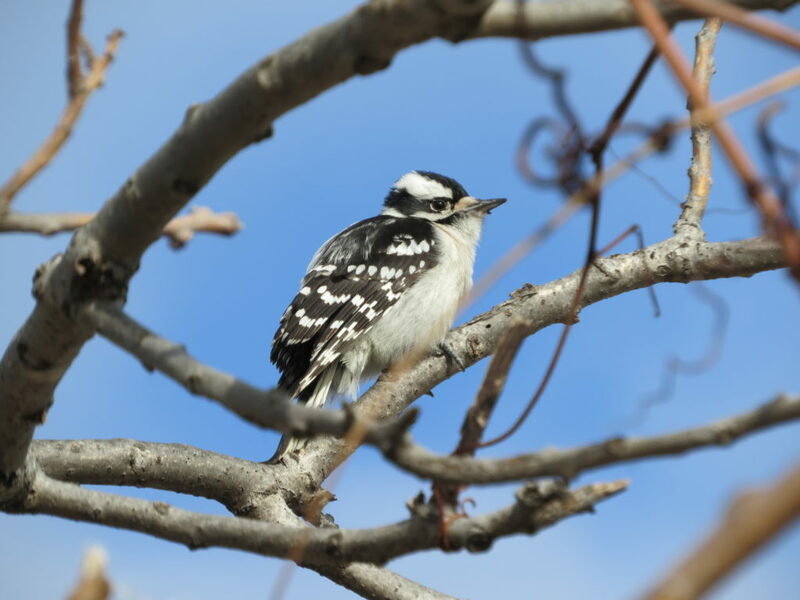 One of the most famous “chiselers” of the backyard is our Downy Woodpecker. Once he locates insects by hearing them inside of a tree, the Downy’s beak chisels the wood in order to reach the insects inside. At a suet feeder, these tame year-round residents have a more relaxed meal. Using their long tongue with its’ sticky saliva and barbs, the Downy Woodpecker can easily extract pieces of suet from the cake that you offer to them. On the opposite end of the spectrum, doves and pigeons have a small bill that does not allow them to chisel or crack seeds. Their soft-based bills are more adept at picking seeds from the ground or eating small seeds that they find in your feeders. Once ingested, they store food in their crop where it is ground with the aid of the muscular part of the stomach called the gizzard. This accounts for their frenzied bouts of eating large quantities of food and then later roosting for long periods as the food is processed. Cardinals, Goldfinches and House Finches have conical shaped beaks that allow them to shell seeds and eat them one after the other. To our benefit, these birds sit at your feeders for longer periods of time, without the need to take seeds away from the feeding station. The action of their bill is the same as a nutcracker in that the grooved upper mandible holds the seed while the lower mandible moves the seed forward and cracks it open, thereby removing the shell. Some of the birds that frequent your feeding station will take a number of seeds away from the feeder and hide them for consumption at a later time. This technique is known as caching and is used by both the Black-capped Chickadee as well as the Blue Jay. The hippocampus in the brain of these birds is disproportionately larger than in other birds. In studies that have been done in these species, when the hippocampus is removed, the birds are still capable of caching food but can no longer relocate it from memory. Many times, the chickadees will cache food from the feeder into nearby crevices in trees in order to get a quick “full plate”, settling in at that spot to eat all of the cached food away from the feeding station. Blue Jays will cache acorns and other mast from trees into the ground, assuring the continuation of that tree species, as the seeds that are not retrieved become next year’s seedlings. Watching the eating habits of the wild feeder birds at your feeding station can be an enjoyable and educational experience as you learn about each bird’s particular method of obtaining it’s “daily bread”.